The White Truffle is a hypogeal mushroom, it means that grows underground. Unlike other mushrooms it is characterized by a very intense and volatile scent. So drying it, freezing it or preparing a sauce to preserve is completely useless, because its characteristic fragrance will fly away. In fact, the first advice we can give you is to consume it within 2-3 days. In fact, its intense fragrance it is destined to fade slowly within a week. Very often we hear about truffle oil. Be wary of this type of product. It’s not natural at all for two reasons: first of all the truffle can not aromatize the oil, so if you think that putting the truffle in the oil this will take on that pleasant smell you are off the road. Secondly, not only will the oil not take the desired aroma, but it will go rancid. In fact, despite being able to slow down the process of deterioration of truffles can not stop it. The result will be the rancid oil and the decomposition of the truffle. The best way to preserve truffle are two: wrap it in paper or cloth and store it in the refrigerator, or vacuum-packed it. With the first method the truffle can be stored for about 1 week. The storage temperature is between 3° and 6° C. It is very important not to clean it before consumption. The layer of earth it has on will help preserve its fragrance. In the fridge it is preferable to store it in an airtight glass container. This will avoid contamination. Not only will the truffle not disperse its scent and transfer it to other foods, but the same is true in reverse. The best advice we can give you is to close it in a jar with some eggs. The shell of the latter is porous, therefore transpiring. If you want a way to give a truffle note to your eggs, this is a very effective method. 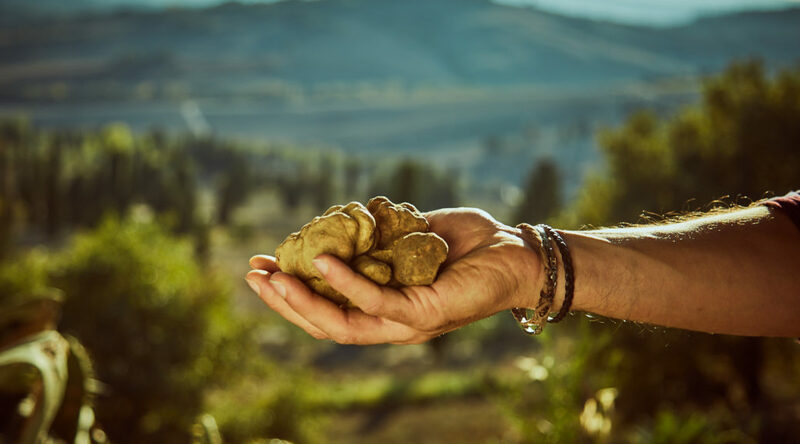 If you clean the truffle under running water you are not making an unforgivable mistake, but it is not the right way to treat this precious ingredient. In fact, unlike mushrooms, truffles do not get wet with water, but anyway many volatile substances that characterize their scent will be washed away. What you need is a toothbrush, a brush, a piece of damp paper and a piece of paring paper. The first step is to remove the excess earth with the toothbrush. Once this operation is completed, remove the powder with the brush and then wipe it with a damp cloth. If this results clean and without stains your cleaning is already finished. If instead it has traces of earth in its folds, moisten the toothbrush and repeat the operation. Once clean you can identify (if any) areas where it started to rot. Those should be removed with the paring knife. At this point your truffle is ready to make masterpieces in your dishes.